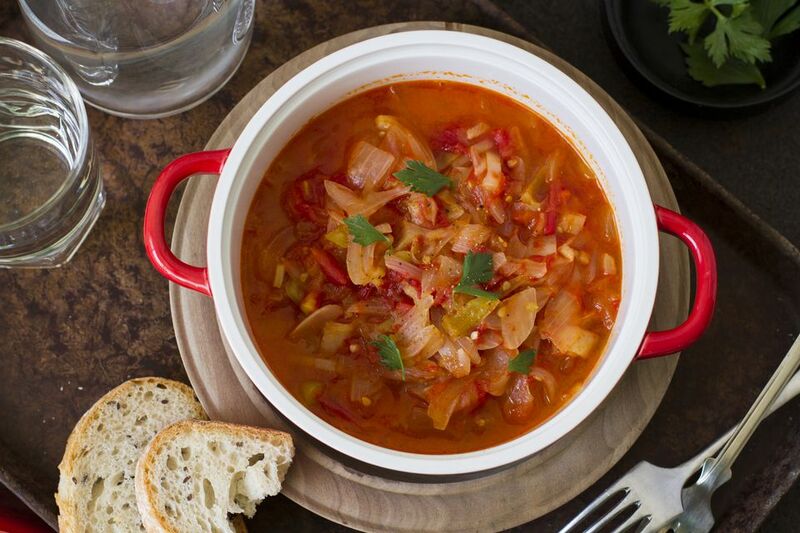 Hungarian lecso (LEH-choh) is a vegetable stew that combines three of Hungary's favorite ingredients—peppers, tomatoes, and paprika. Lecso can be served variously as a vegetable side dish, appetizer or the main meal itself (see the variations below). Many cooks preserve lecso by processing it in a hot water bath to be used in the winter months. It's similar to Serbian djuvece, Russian letcho, and French ratatouille. Hungarian wax peppers, banana peppers or Italian green peppers (elongated) are preferred, but green bell peppers will work in a pinch. Shortcut: Use 2 (14 1/2-ounce) cans drained diced tomatoes instead of fresh. French Ratatouille Recipe: This traditional vegetable stew originated as a poor man’s dish in Nice, France. These days, the stew is known and loved around the world and is often considered gourmet fare. Serbian Ajvar Recipe: This roasted eggplant-sweet-pepper mixture is sometimes referred to as vegetarian caviar. It can be mashed or left chunky, depending on personal taste, and served as a relish, vegetable or spread on country-style white bread like pogacha as an appetizer. Its smoky flavor is a great match for grilled or roasted meats, especially lamb. Basque Piperade Recipe: This is a spicy tomato-pepper sauce with many of the same components as lecso. It can be used as a stewing or braising ingredient or a garnish to a finished dish. A pinch of sugar mellows out the sharp tang and acidity of the tomatoes and peppers. In a large skillet, sauté the onion in bacon fat or oil over low heat for 5 minutes. Add pepper strips and cook another 15 minutes. Add tomatoes, sugar, salt and paprika and cook for another 25 to 30 minutes, stirring occasionally, or until mixture resembles chunky tomato sauce. Add 1/4 cup cooked rice to the finished dish and warm through. For an appetizer, add 1/4 pound thin-sliced Hungarian Debreceni sausage to the finished dish. To make this a full meal, add 1 1/2 pounds smoked or fresh Hungarian sausage.